Charming detached Victorian villa with stunning sea views in highly desirable area. 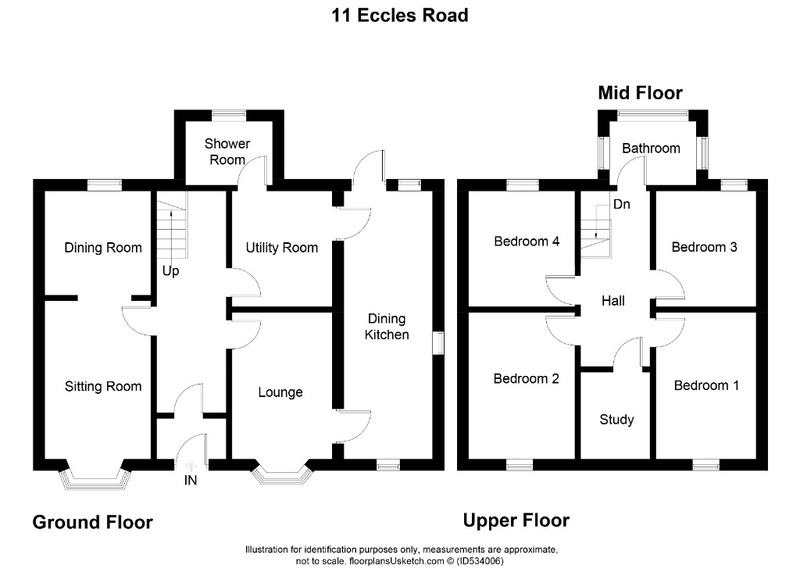 ‘Hazelwood’ comprises 4 double bedrooms, three reception rooms, bathroom and shower room, study and utility room and, externally, a self-contained annexe, good sized front and back gardens and garage. Brimming with character and original features, benefitting by an aesthetically pleasing and very practical multi-fuel stove with the added bonus of being a very short stroll to Western Ferries, this beautiful property would make an ideal family home, in a prime location. A pedestrian gate opens to a pathway which bisects the front lawn and leads to the entrance portico and on to the front door. A driveway runs up the side of the house to the garage at the rear of the garden. Nice, tiled entrance portico which stretches to the front of the house and offers a relaxing place to sit and enjoy the vista. A wooden door with glass panels opens to the welcoming hallway where you are immediately drawn to the original features such as high ceilings, ornate cornicing, ceiling rose and deep skirtings, all of which are characteristics of the entire property. From the hall there is access to the sitting / dining room, lounge, utility room and shower room as well as the staircase to the upper floor. An under-stair cupboard offers ample space for hanging coats and storing shoes, bags and more. Expansive and very sociable room which runs the full depth of the house with the sitting room at the front where the large bay windows offer those lovely views and the dining section is at the rear with a door directly to the back patio area. Situated at the front and also with an enviable vista through the bay windows. Another room full of character and with a fantastic multi-fuel stove for those cold and stormy nights. Another sociable room which runs the depth of the house and provides a more informal place to gather with friends or family. The kitchen has white, country-style, wall and base units and an impressive double oven with gas hobs, perfect when cooking for the whole family! Triple aspect with bay windows to the front at the dining section and further windows to the side and rear ensure that plenty of natural light always streams in. Accessed from both the lounge and the utility room. Spacious room at the rear which is plumbed for washing machine and dryer and has ample space for drying, ironing and storage. Window to the back garden. Modern downstairs shower room comprises walk-in shower cubicle, WC and wash-hand basin, tiled walls, wall-mounted radiator and windows to the side and back. From the downstairs hallway there is a carpeted staircase with wooden balustrade which runs, first of all, to the half-landing where the main family bathroom is located and beyond that to the upper level of the property. Flooded with natural light with frosted windows on three sides, the room comprises bath, WC, wash-hand basin, tiled walls and radiator. This carpeted upper hallway provides access to all upstairs rooms and has enough space for occasional furniture. Large, front-facing, master bedroom providing elevated views of the Firth of Clyde and beyond. Good walk-in cupboard. Another front-facing double bedroom with equally impressive views out to sea. The room is carpeted, has a wall mounted radiator and alcove with shelves. This double bedroom has a large window which provides both plenty of light and views over the back garden. The room is carpeted and has a wall mounted radiator. From this room there is access to the loft via a hatch in the roof. The double size fourth bedroom has a large window which faces out to the back of the property. The room is carpeted and has a wall mounted radiator. This room is currently used as a home office but could serve many other purposes such as a nursery or play room. There is small Velux window to the front of the property and the room is carpeted. Situated in the back garden, is the excellent, fully self-contained annexe comprising open-plan lounge / kitchen, bedroom and shower room with shower, wash-hand basin and WC. An ideal teenager’s pad, guest accommodation or office. To the front of the house there is a path running from the road up to the front door. The rest of the front garden is lawn with some surrounding shrubs and bushes. The front garden offers views to the River Clyde and the hills beyond. The back garden has a large patio area with space for sitting out in the sun and room for a coal bunker, barbeque and garden dining table. With outdoor lighting in place and views over the house to the sea the patio area is perfectly situated to enjoy al-fresco dining on a warm summers evening. From the patio area there are steps which lead up to a grass lawn with rockery and up to the annexe and beyond that the garage. The property also benefits from a large cellar which has electricity and ample space for storage. The driveway passes the side of the house to the garage at the back of the property. The garage has lighting and power and has ample room for parking a car while still maintaining space for storing outdoor tools and equipment. Please note that the driveway is shared with the property behind Hazelwood.